It’s orchid season here at Long Stems and we are getting excited unpacking all of our unique varieties! These orchids make the perfect Valentine’s Day gift. An orchid is the perfect gift to spruce up any home or office space, their exotic blooms will leave your special someone in awe. 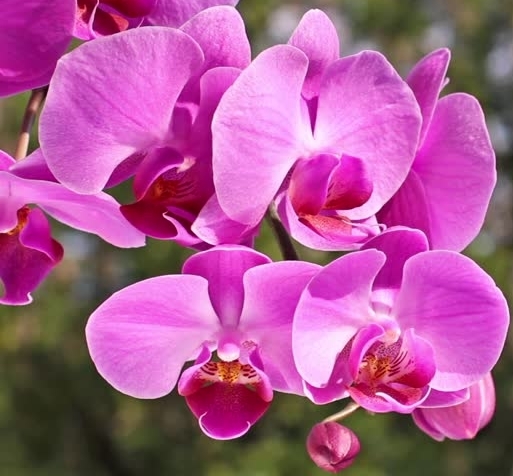 Did you know there are over 25,000 species of orchids worldwide, with over 100,000 color variation! Here at Long Stems we don't carry every variety but we have a wide selection of different species and colors. Phalaenopsis Orchids (Above) are one of the most popular varieties. Their large and colorful blooms make them very appealing, along with their relatively easy care and high chance of re-blooming indoors. Orchid plants grow in tropical rainforests and thus in general require a high amount of humidity and water but most varieties of orchids need to be drained thoroughly and not sit in any water. The original classification name for orchids (Epidendrum) means ‘tree-dwelling’ because of the high amount of orchids that nest among the canopy of rainforests. Orchid Plants are an ancient symbol of love in many cultures. 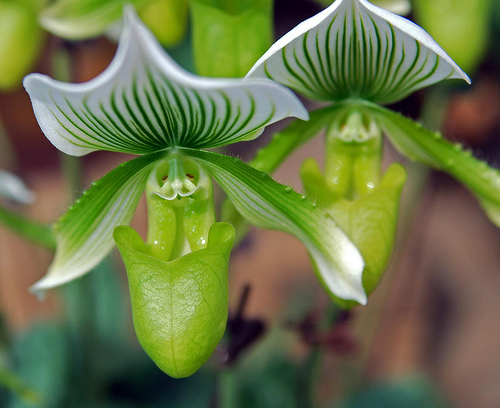 The ancient Chinese cultivated orchid plants for centuries. It wasn't until 370 B.C. when the plants were first mentioned in Greek writings by the philosopher Theophratus. In Greek and Roman culture Orchids were highly prized for their supposed aphrodisiac properties. Cymbidium Orchids (Above) come into Long Stems as cut flowers all through the year but this time of year we get in these impressive plants. Make sure you have room for this large plant, some 3 or 4 flower spikes. They can even be moved outdoors in the shade during the summer months! Miltoniopsis Orchid (Above) or more commonly known as the Pansy Face Orchid is another popular variety. They are prized for their large blooms that are sometimes even fragrant and for their many blooms and buds for each plant. 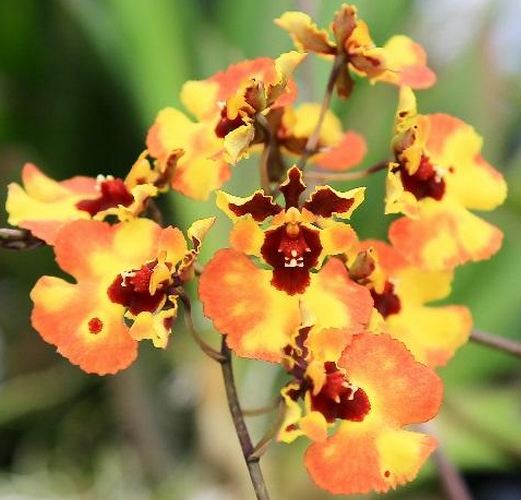 Oncidium Orchids (Above) are another favorite variety with some spikes getting upwards of 100 flowers. Many of these plants bloom on a 9 month cycle meaning that within 18 months the plant will have bloomed twice. Brassidium Orchids are sure to impress any orchid connoisseur. The stunning color variations along with its high volume of blooms make this a very popular plant. Paphiopedilum (Above) also known as the Lady Slipper Orchid is a variety than any collector would prize. They generally only have one or two flowers but the stunning beauty of each bloom makes them well worth it. The flower lasts for ten weeks or more! 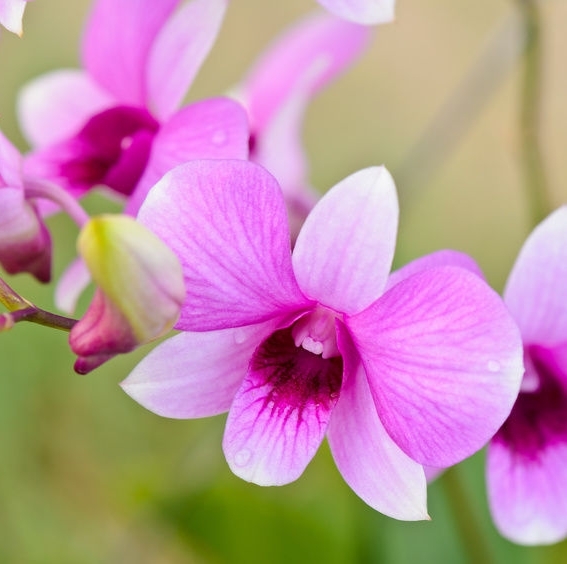 Dendrobium Orchids (Above) are an easy care plant that has a high chance of re-blooming. This plant comes in a range of sizes and colors to fit anyone’s Valentine’s Day wishes. Vanda Orchid (Above) are known for their vibrant purple/blue and pink blooms. These orchid grow out of soil and use their long air roots to gather moisture. Make sure to keep them humid. Here at Long Stems all of our orchids are grown in the United States and Canada in greenhouses, that means that the orchids spend less time being transported to us. What sets our orchids apart from those at a large retailers or chain stores is that our orchids spend less than one day on route to our store. 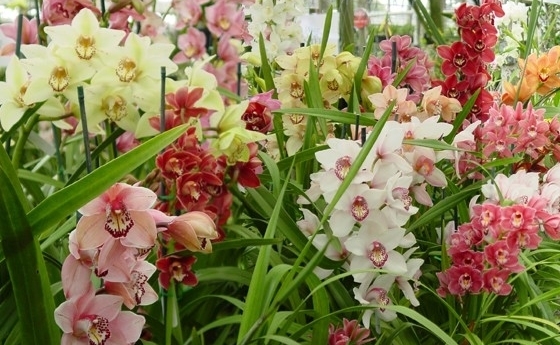 Orchids are very delicate plants that are easily stressed by temperature changes and light changes. Grocery stores and other large retailers can have their orchid plants sit in a box for upwards of two weeks, this severely hurts the longevity of the bloom as well as the likelihood of the plant ever re-blooming. Make sure to spend this Valentine's Day nestled up with your special someone along side the perfect orchid plant for you!